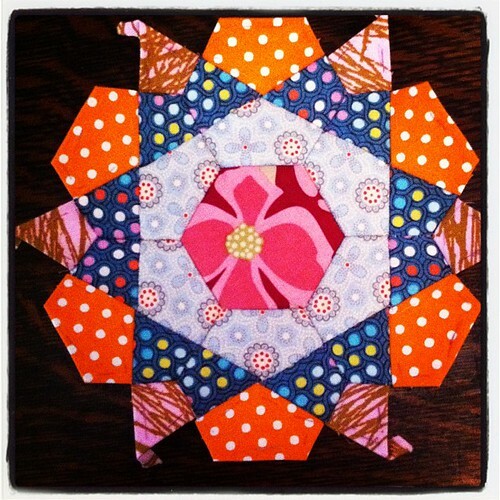 I've decided how to work the background on these rose star blocks. 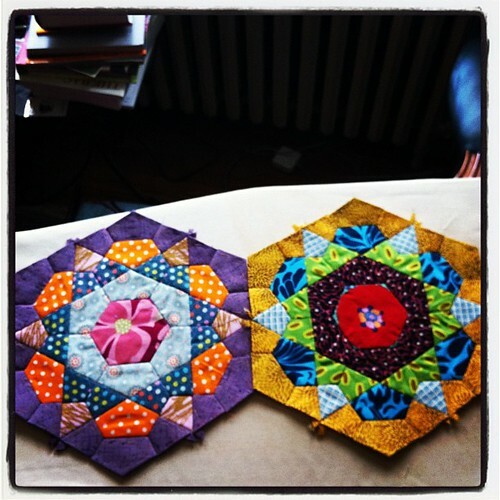 I'm going to give each one a different background, forming the block into a large hexagon. It takes 18 pieces to make the background for each star. 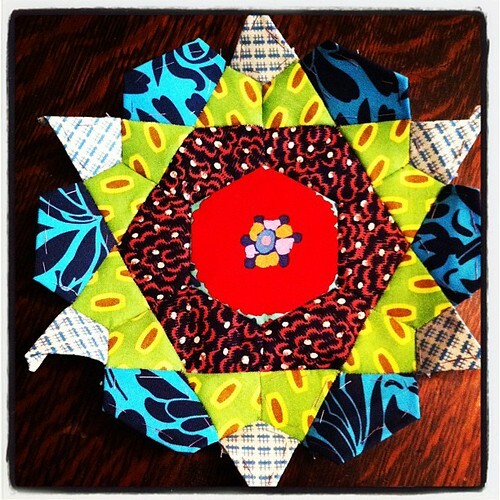 When the background is attached, the resulting hexagon is 9" across. Here are the two the I've stitched the background to so far - I've placed them together so you can see how they'll join up. This is my sixth rose star. I've made a vow not to make any more until I get the background stitched onto the other four. Then I'll do the backgrounds along with the stars themselves - otherwise having to do a whole fleet of backgrounds before I can sew them together will be a recipe for terminal procrastination! Just to prove that I'm not a person who can't be satisfied with my own work, let me tell you how thrilled I am with the way this Chinese Gongs quilt top has worked out. 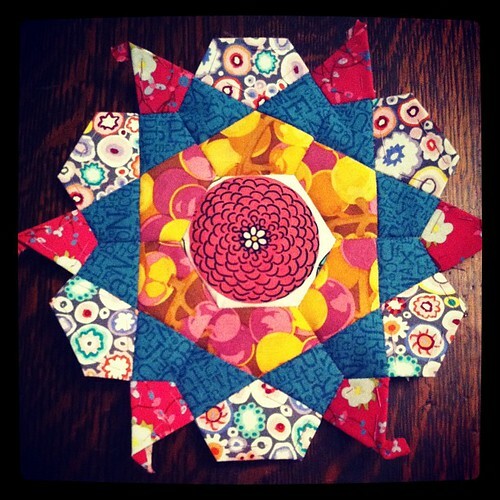 To recap details from a previous blog post, the block here is called Chinese Gongs. 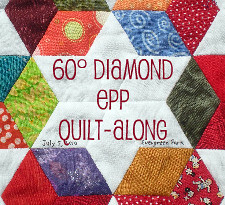 It is a traditional block that appears in Jinny Beyers's encyclopedia and in Barbara Brackman's big book of quilt blocks. I found it online here. It says it was featured in Nancy Cabot's column in the Chicago Tribune in 1937. I love this block to death, and I plan to make many more of them. Partly I think I'm so happy because it's the first time I have drafted my own pattern with a compass and a ruler. I've worked out how to make traditional blocks without an actual pattern or cutting directions before, but they have always been pretty easy to figure out, mathwise, and the curves in this one added a bit of a twist. I also managed to get the directionality of the print oriented the right way (on all except one block - rats). And amazingly, I had enough of the brown solid to make 99.9% of the blocks, and was able to use a brown FQ from this bundle of Heather Ross Far Far Away III to supplement, and you can't even really tell it is a different fabric. I'm going to use some more of the FFA for the back. If I have some batting in the basement, I'll put it all together and get started quilting it tomorrow. I can't wait to make a finish out of this! 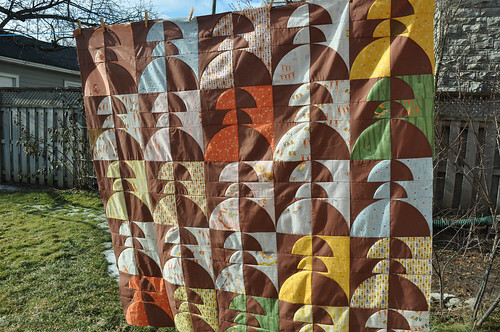 I'm overwhelmed by all the love I got in the comments on my post about The Worst Quilt I Ever Made. I am taking a break from obsessing over it, and when I look at it again, I may feel it isn't so bad. Many people reminded me how we are our own worst critics. And, after all, it is finished, and that is worth celebrating, since "finished is way better than perfect" when it comes to quilts! I also wanted to show you my new hand project. 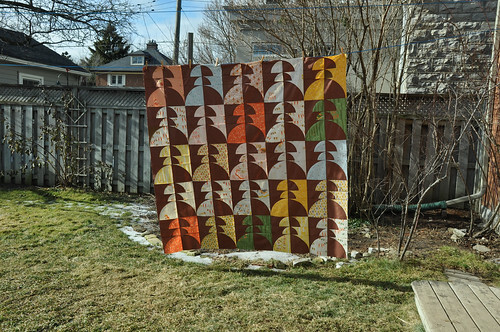 After completing this EPP stars top, I found myself in withdrawal from hand piecing. I love having a project I can work on in the evening while I watch TV. 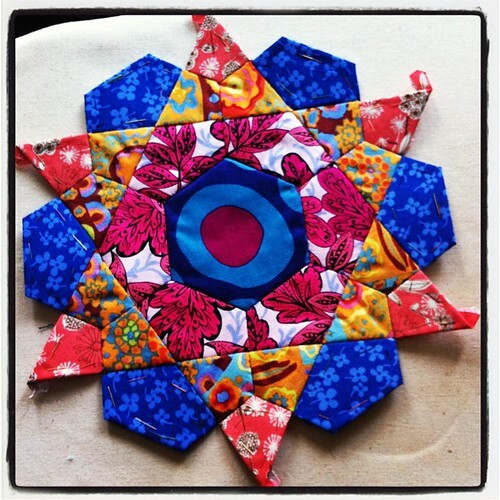 I started a scrappy EPP hexagon project, and it was fine, but I couldn't help but feel it was somewhat lacklustre. Then I read about this QAL. I was hooked. 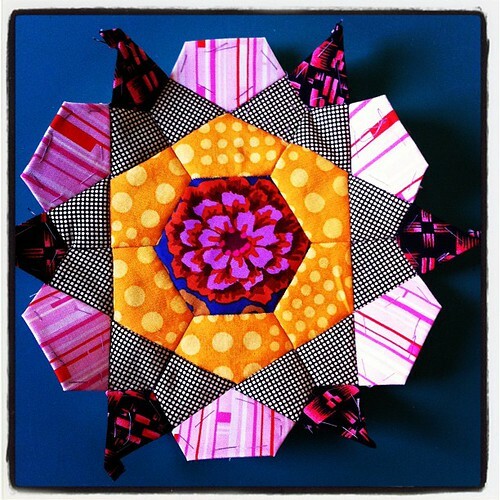 I started out using this tutorial by Summerfete. But in the Flickr group, one of the members posted a drafted template that I have been using. Each block has 31 pieces, but there are only three different shapes. 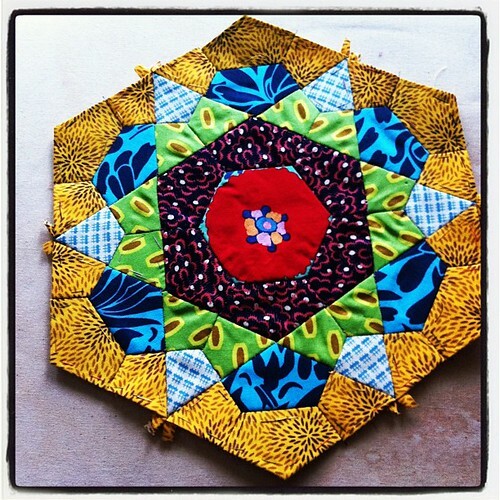 In my block, the centre hexagon is 3" across. I understand that it is possible to make this block using only one piece - a kite - but that would nearly double the number of pieces per block. Life is long, but not that long. I'm happy with the more limited options that the fewer pieces gives me. As they are, they do not tesselate, so another step will be required to join them all together. I can see at least three possible options. 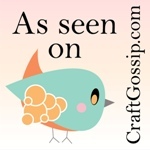 One is to applique each block to a background. The other two options both require additional pieces fit to each block. In one case, it would result in stars that are look closely interlocked, as in the photos here. The last option builds out around each star so that the star is enclosed in a hexagon. 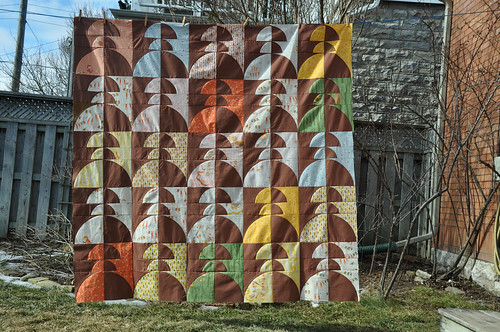 It looks like this was the approach taken in Jazz Hands, a quilt in one of the Modern Obsession books. 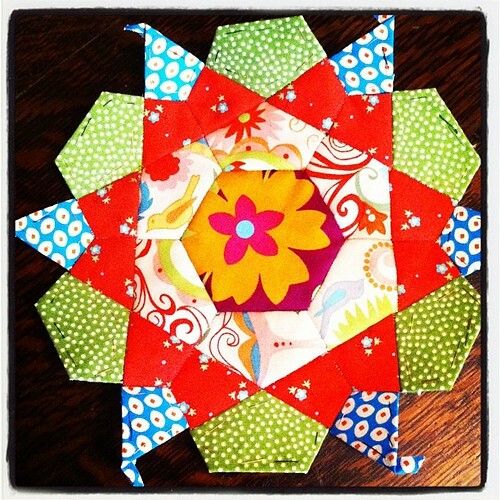 I like this option best, as I can use different backgrounds for each block and it will give a kind of millefiori effect. It will also be different from the effect of my other EPP project, where all the stars are surrounded by a same-seeming light background.